N.P. Upadhyaya: Nepal’s number one conspiratorial political brain, Kamal Thapa recalls how 2005-2006 political movement was organized and which country in effect exported the Delhi residing Maoists back to Nepal. Thapa is currently the chairman of the RPP-Nepal. Thapa, the handpicked Home Minister during the fag end of Monarchial rule in Nepal recalls how India engineered the agitation yet gave the impression of being commanded by the seven party alliance to the general public. The idea was clearly to glue the New Delhi nurtured Nepal’s rebels in Kathmandu’s power corridors so that Nepal could ever remain within the Indian security ambit and also guarantee that Nepali regimes there after maintain a comfortable distance with the Chinese regime. India’s top leaders have time and again publicly expressed their distaste against China. Late George Fernandez, a former defense minister had publicly declared that China is India’s number one enemy. Late George had reportedly managed to supply lethal weapons to and provided military training to Nepali Maoists to fight against their own country. Thapa who established his political career during Panchayati days by clinging to the Royal family members for several decades, including even the sovereign monarch, very recently talked to Madhusudan Bhattarai of Naya Patrika Daily dated 26 January 2019. Kamal Thapa, claim keen political observers, is not a very reliable political person. He is also a shaky political persona, it is believed. Yet, what is the harm in listening to his version of politics that took a very nasty turn culminating into the ouster of Royal Institution of Nepal in 2005-2006. Kamal Thapa recalls, Girija Prasad Koirala had even asked Chairman Prachanda of the outlawed Maoists’ party to step up violence against the government to foil prospect of municipal elections slated to be held on February 4, 2006. The Maoists then killed a local candidate in Biratnagar and attacked another in Lalitpur district, recalls Thapa. In return, Prachanda asked Koirala to stand by the side of his party and that he will step up violence in the country to destabilize King Gyanendra and the government led by Him. Thapa adds, in the meantime, King Gyanendra approached former Nepali Congress leader Krishna Prasad Bhattarai requesting him to assume the post of the Prime Minister, which was declined by Bhattarai. Frustrated by Girija Prasad’s hegemony in the party, Bhattarai- one of the founder-leader of the party, had bid adieu later to the party to avoid public humiliation. The movement at that time was not gaining any momentum as liked by the political leaders. The external power(s) that were pumping all sorts of support to the anti-monarchy agitation were also getting restive. The foreign power eventually became successful in bringing the outlawed Maoist Party and the democratic parties together. They were forced into the streets of Kathmandu and were told to take violent measures against the King’s regime in a collective manner. Recalling an important event says Thapa, “Girija Babu in the beginning had demanded keeping the municipal level elections on hold, allowing him some space to initiate talks with the Royal government”. While the government was considering his demand, Koirala out of the blue informed that he can no longer avoid Maoists and that any cooperation with the King’s government was impossible. The external forces that were funding the 2005-2006 movement were only focused on doing away with Royal institution through the help Maoists. This meant that not only Indian regime but some European powers too preferred ouster of Nepali monarchy. This is meaningful. The Norwegians were directly involved in the Maoists led people’s War. The Development Minister of Norway Eric Solheim is on record to have talked to Prachanda both in the Rolpa Jungles and in Delhi. Around this time, the Seven agitating party then stationed in Delhi had already inked the Delhi drafted 12 point agreement to which the then US Ambassador James F. Moriarty disliked. The reality is that the US envoy preferred a compromise between the King and the seven party alliance and wished that the powers were handed over to the political parties by the King. Kamal Thapa says that the King wanted to handover the State authority to the agitating political parties much ahead of Dr. Karn Singh’s arrival as he did not want to act as per the dictates of the foreigners. Dr. Karn Singh and Indian foreign secretary Shyam Saran landed in Kathmandu as the Indian emissaries on 20 April 2006. The King and Dr. Karan Singh held a one on one meeting. The King was about to make an announcement soon. And he did this on April 21, 2006 which practically convinced all the political parties in the agitation save the indoctrinated Maoists. The Maoists had structured reasons for rejecting the Royal announcement made on the previous day. 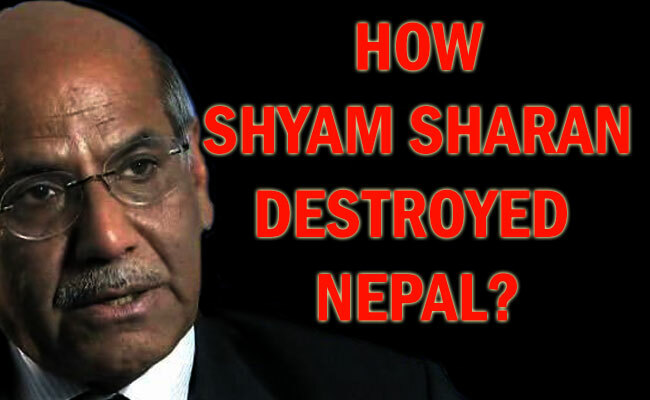 In fact the Maoists were totally under the firm grip of Indian Foreign Secretary Shyam Sharan. The mistake that the then monarch did was he shared a luncheon with Dr. Singh, but the accompanying Shyam Saran was told to stay out. It was this event that enraged Saran, claim observers. He utilized this Royal blunder instantly to his benefit. He made several calls to Maoists leaders and ordered them not to accept the Royal announcement under any circumstances. The movement took a nasty and ugly turn when the Indian Foreign Secretary went back to New Delhi and started pumping more money into the agitation, which pressurized the sitting monarch to kneel down. The King understood the mood of the agitating Maoists who had become violent and preferred not to shed blood of the innocent people to which he could have done easily. Under pressure King Gyanendra had to give a new lease of life to the dead parliament. He revived the Parliament in an illegal manner as there had been no constitutional provisions for the King to revive it. Additionally, Nepal Army also cheated the King that time, as is being talked these days. Rukmangad Katwal was the Army Chief then. The King knelt down which is why he is still popular among the people. It was this revived dead parliament which later did away with the Royal Institution. The rest is history. The former Nepal Monarch is currently meeting his former “subjects” in Simra, Nepal.